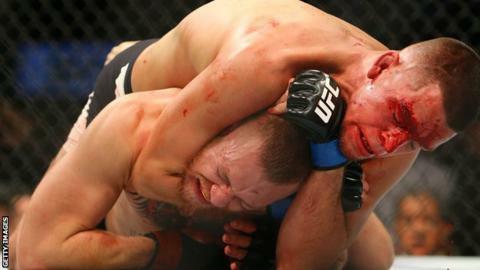 Conor McGregor has been given the chance to avenge his loss to Nate Diaz in the Ultimate Fighting Championship. The two mixed martial artists will meet again in another welterweight contest at UFC 200 in Las Vegas on 9 July. American Diaz handed McGregor his first defeat in the UFC earlier this month when he choked the featherweight champion into submission. UFC boss Dana White said he urged McGregor to fight Diaz at a lower weight but the Irishman was against it. "Even his coach tried to get him to get off the rematch and the 170-pound fight, but it's what he wanted," said White. McGregor fought Diaz at 170 pounds, 25 more than his usual featherweight limit, at UFC 196. "He was obsessed with fighting Nate Diaz again," said White. White said Jose Aldo and Frankie Edgar would also meet on the UFC 200 card, with the winner then taking on McGregor for the featherweight belt regardless of the Irishman's result against Diaz.